Soon, diagnosing cancer could be as simple as a pinprick. Cancer is often difficult to treat because it’s not detected in time. That there are more than 100 types of cancer, each with various possible causes, doesn’t help. This is why a team of researchers led by the National Cancer Center Japan (NCC) in Tokyo, together with Toray Industries, Inc., and other institutions, want to change things. They’ve developed a new method that could detect 13 different cancer types using just a single drop of blood. The novel method detects differences in the microRNA (miRNA), which can be secreted by cells into the blood as a way to communicate with other cells, between healthy cells and cancer cells. 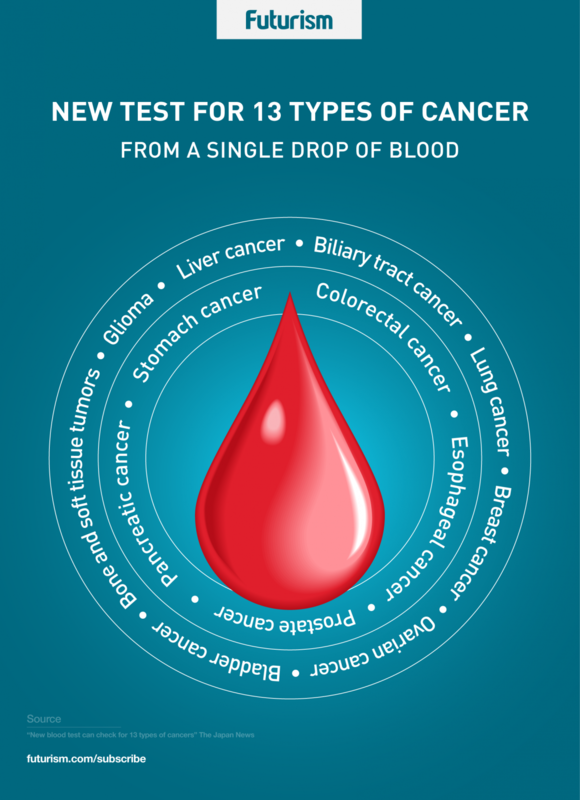 Using just one drop of blood, the test may be able to detect cancers in the breast, lung, stomach, colorectal tract, esophagus, liver, and pancreas. In a lab test using preserved blood samples from 40,000 patients, the researchers were able to identify miRNA specific to each type of cancer with more than 95 percent accuracy. The researchers noted, however, that the miRNA could have changed while the blood was preserved. As such, clinical tests planned for August would use fresh blood from 3,000 people. While there are a number of studies in using blood to detect cancer, the Japanese team’s method is the first that’s known to be capable of diagnosing multiple types with a single test, The Japan News reports. This could potentially improve a patient’s chances of being properly diagnosed, while at the same time eliminating the need for separate tests. “Patients will not need to take multiple tests. In the future, it will become possible to identify cancer stages and characteristics,” said Yet Takahiro Ochiya, head of the Molecular and Cellular Medicine Division at the NCC’s Research Institute, The Japan News reported. The Japanese researchers got a go-ahead to proceed to clinical tests from the NCC’s research and ethics screening committee sometime in the middle of July. They plan on applying for government approval next, which could open their method for practical use in the next three years.